Christine here. Sometimes, I admit it, I don’t like braiding. Sometimes it just takes too long and I wonder why I didn’t end up totally immersed and obsessed by some other sort of craft. Something quicker to execute each design, so that I don’t end up spending all summer doing one thing only! Here is my latest attempt (above) to get the braided wavy parallel lines that I wanted. You can probably tell that I have safety pins all over the rug, where I have marked off (by loop count) the same spots on each color. 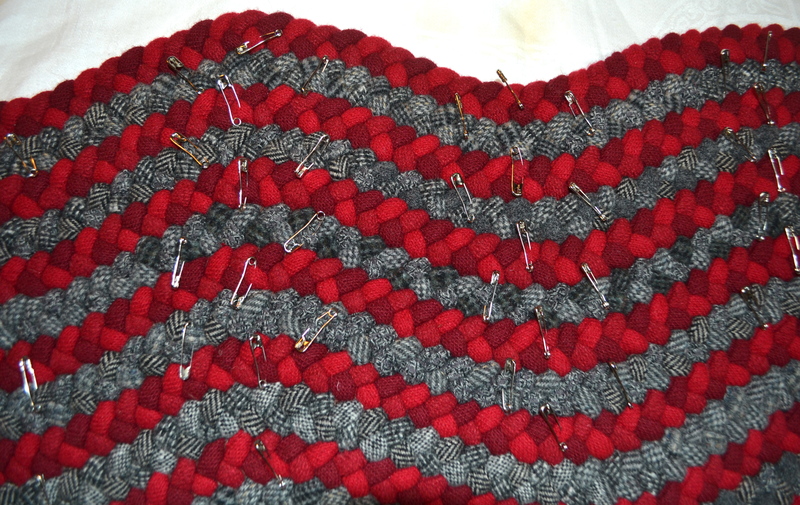 I increase or decrease twice on each curve with the gray strands, and once on each curve with the red strands. This amount enables me to have the curves I wanted while keeping the lines parallel. If I make the curves deeper than this amount, I end up having to change the amount of increases or decreases to get the braids to lie flat, and the braids are no longer parallel. Why, you may ask, was I so determined to figure this out — what is the maximal braided curve that can be laced in parallel? Sometimes I think I just have an obsessive personality. I have 4 to 6 more braids to lace on before this will be a reasonably-sized rug, and I am not looking forward to it. I’ve already figured it out, so now I want to move on to the next thing, and figure that out. With any craft, though, there are the parts you enjoy and the parts that you just slog through. At the moment, the next 4 to 6 rows are slogging. One thing that I have been enjoying in this process, though, is using up my tremendous stash of gray wool skirts, pants, and the occasional really sumptuous jacket that I have purchased over the years. (I don’t usually buy jackets because they’re such a pain to cut up, but occasionally a jacket’s wool sleeve will reach out and caress me while I am wandering in the thrift store, and I will be unable to resist it). I had an immense pile of these medium grays in tweeds and herringbones and glen plaids, and I finally stripped them all and sewed them randomly together in huge rolls. Each time I come upon a new color and the slip of the fabric changes slightly in my fingers, I enjoy the new gray’s softness. This frustrated, angry, and distracted sort of completion is always how it is with me — I can’t wait to finish things so that I can move on to the next project. As if it is somehow the rug’s fault instead of my own, I come to loathe and despise the last few rows of anything I make because finishing this rug is keeping me from doing what I want — moving on to the next project. Right now, I am mentally working out how to have the super-sinuous non-parallel rug (see sketch in earlier post) lay flat despite all of its monstrous curves, and THAT is what I WANT to be working on, not THIS.